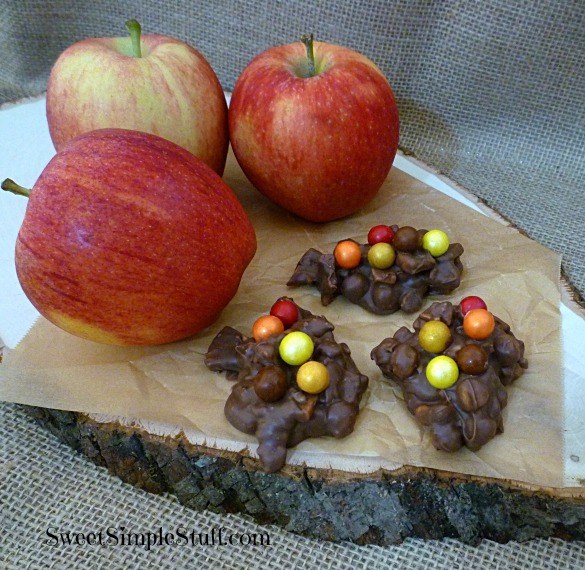 One of my favorite things about fall is apples … caramel apples … caramel apples dipped in chocolate. 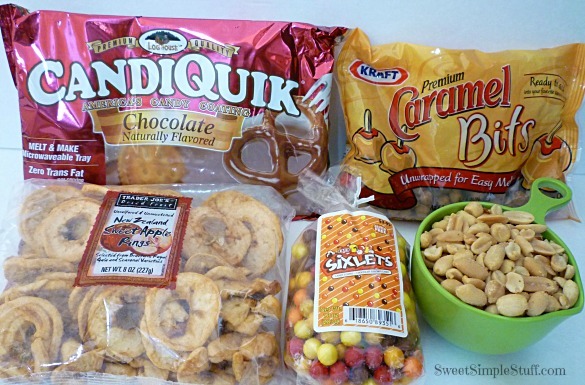 OK, I have a few favorite apple treats. I haven’t even mentioned apple muffins, apple pies … I could go on and on! 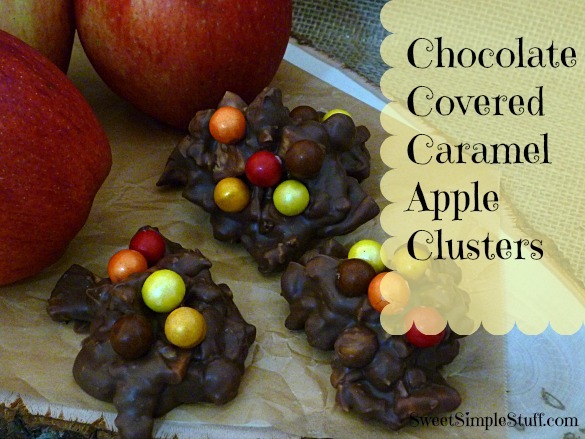 These clusters are much easier and faster to make than dipping apples in caramel … letting the caramel set up … then dipping it in chocolate and sprinkling with nuts and letting it set up again! 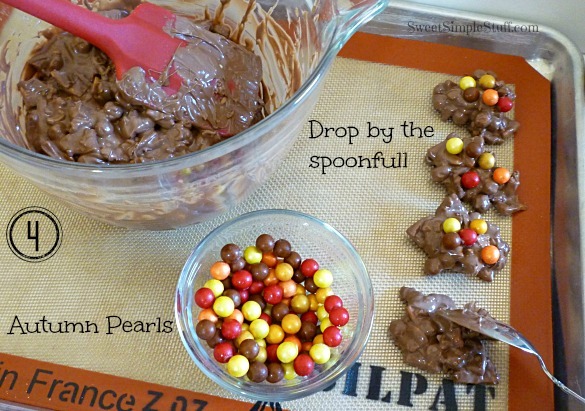 Plus I added these pretty Autumn Sixlets … they look like pearls!!! Do you ever have one of those projects that starts with one item and then you build around it? This was one of those projects for me. It all started at Cracker Barrel … I shared my Cracker Barrel obsession a while ago … I purchased the cast iron skillet that I intended to buy … went outside the store … where the family was patiently waiting … in rocking chairs. My sister-in-law showed me this little bag of Autumn Sixlets that she bought to put in a candy dish at Thanksgiving … well, I simply HAD to have some too … went back in the store, before anyone could stop me and bought a bag. 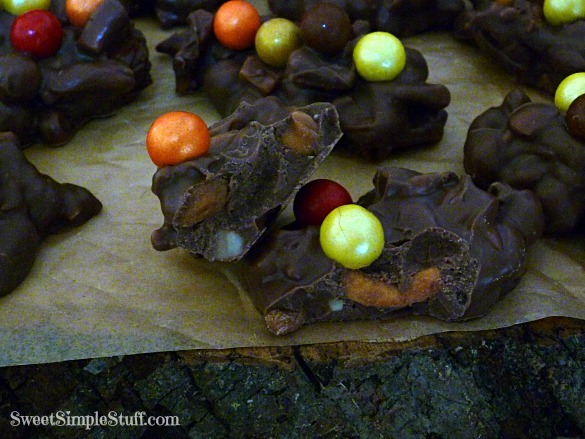 That was back in July … I’ve been trying to decide how to use the Sixlets and came up with these clusters … flavors of fall that are decorated with the colors of fall. 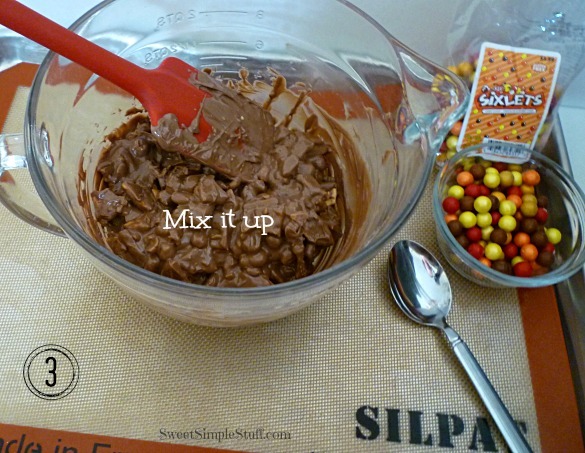 Pour the melted chocolate (CandiQuik) into a large mixing bowl. 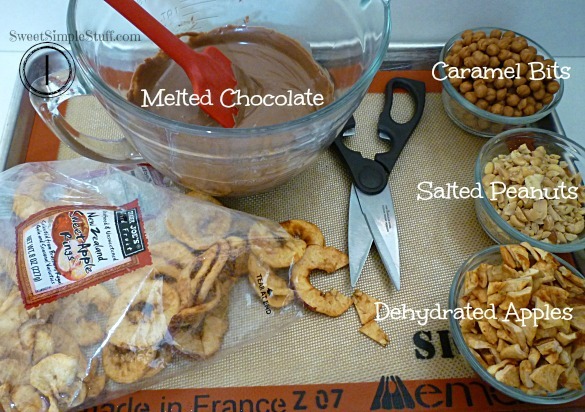 Add caramel bits, coarsely chopped peanuts and apple bits to melted chocolate. Thank you to Miss CandiQuik for providing me with the chocolate 🙂 All opinions are my own. If you chop up real apples, do they get soggy or go bad? I’m wondering why you chose to use dehydrated apples. Thanks for the answer to my “burning question”. KNEW there had to be a reason. Those fall Sixlets are so pretty. You have hit the jackpot here, my genius friend! I live the idea of caramel apple but dont enjoy them as there is never enough caramel and chocolate compared to the apple. Thank you Dinaz 🙂 My personal opinion is … you never can have too much caramel! 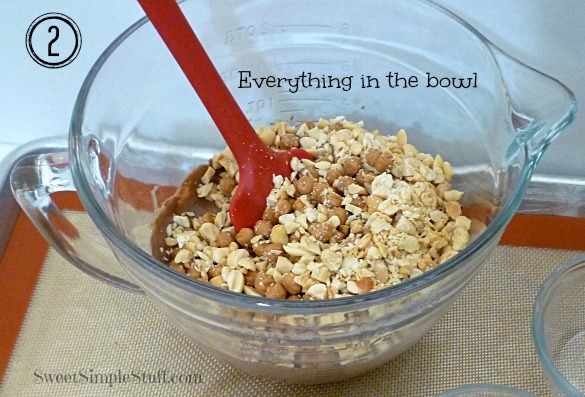 Love your idea, I don’t make the caramel apples because of the time and mess, this just looks so easy. I have a hard time chewing the dried apples but I bet these could be made with some kind of chewy apple candy cut into little pieces. Thank you Kelly 😉 It is easy and the dried apples were about the same texture as raisins … let me know how the candies turn out! I think Ican even master these! These really do look yummy and easy peasy, as you say. Can’t wait to try them. I was thinking the same about the fresh apples, I was dipping some pastries today and I was thinking how much trouble it was to bite into the whole apple and how much better it would be if they can in little sticks like the pastry. Your dried apples are a good solution. These look great. I find that I love dried fruit when used in stuff like this. I’ll have to try these. I’d love for you to stop by my link party, Manic Monday. Starts tonight at 8pm EST. Hope you stop by! Thank you Renea 🙂 and thank you for the invite! These look wonderful!! I love dried apples and this is the perfect recipe for them! Thanks for sharing! How did these slip past me last week?! I’m in love w/ these – I’ve never seen anything quite like them and I love that! Me again. I forgot you said you got the autumn sixlets at Cracker Barrell which we have but I don’t get there often. Found them in a little bottle at Walmart in case someone doesn’t live near a C. Barrel. They were in the middle aisle with the special Halloween cake mixes & sprinkles – not in the reg. baking/sprinkle section. They were a little expensive but they sure are pretty. Will have to check prices and ounces at Cracker Barrel as I don’t think there’s enough in the little Walmart bottle (which I’ve already temporarily misplaced). Thank you for that info! The bag I bought at CB was 10 ounces @ $3.99.